For many looking to DIY their own wedding invitations, striking a balance between elegance and simplicity can be difficult. First you must find a professional looking template (hint: pay a few dollars for one created by a good graphic artist), then effectively print and finish them. Today’s tutorial, provided courtesy of the oh-so-talented Anna Skye of Download & Print, can help. 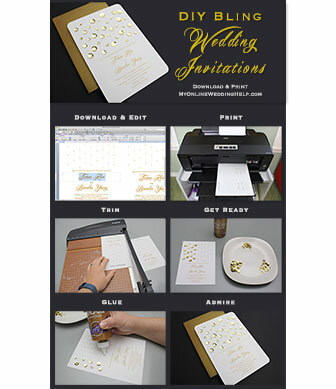 She uses a template she designed and sells to show you how to create and embellish your own DIY bling wedding invitations. Note: As with most links on MyOnlineWeddingHelp.com, the links in this post go to this site’s shop section or directly to a merchant. My Online Wedding Help will receive a small commission from Anna if you click and buy a template from her. Ditto for other merchants. 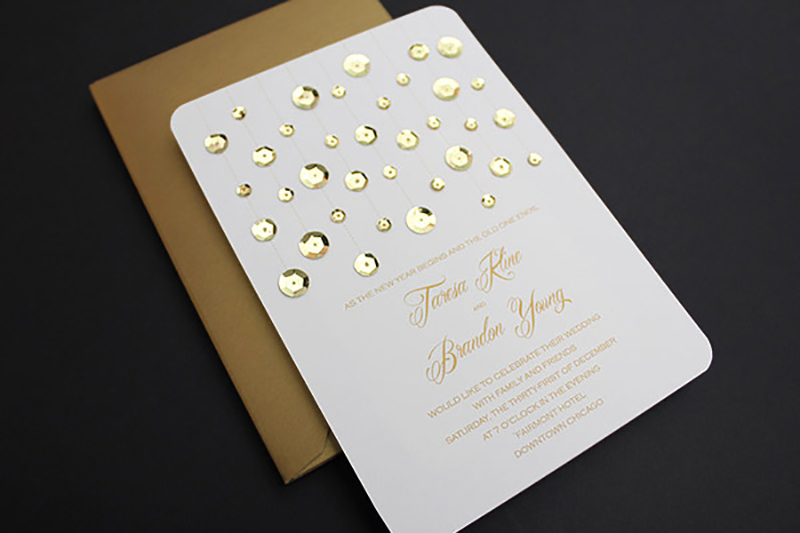 This sparkly and glamorous invitation was inspired by the chandelier at the Winspear Opera House in Dallas. While the tutorial is for a gold on white wedding invitation, it can work well in other color combinations and for other events. Change the sequins to white to look like snow, or red and green to look like Christmas ornaments and this can easily be a holiday card or invite. The possibilities are endless. White card stock in 65lb to 110lb weight. You could also use black, to get an effect similar to the black and gold invitations here, or any color combination you prefer. A7 size greeting card envelopes in metallic gold (or silver or whatever). She used Mardian as the script font and Copperplate Light for the information text. If you do not have these fonts installed in Word, you can download them free here and here, or use the substitution fonts the program will suggest when opening the template. Also, if you prefer another letter style combination, you can switch out the fonts. 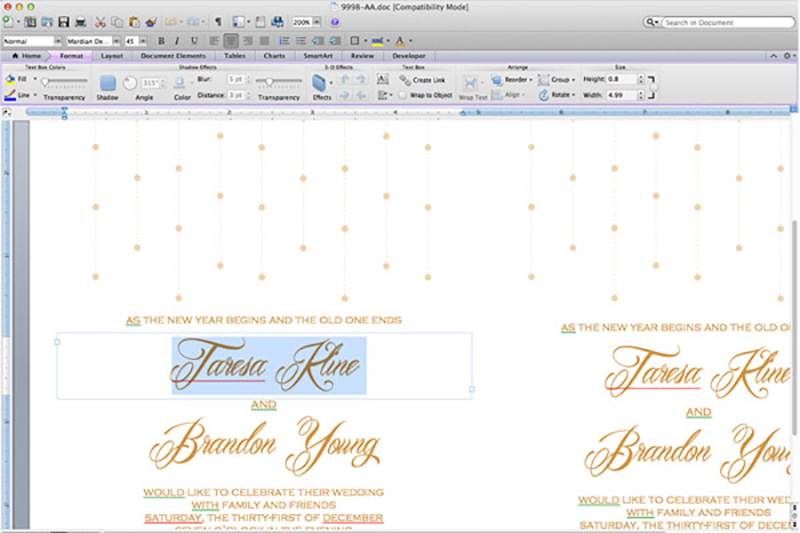 Take a look at the Wedding Invitation Font Combinations pinboard for inspiration. After you have the font and text the way you like it, print one copy and proofread carefully. Review your text to check for spacing, punctuation, and spelling errors. Get a second set of eyes to look at your draft as there is nothing worse than printing 100 invitations to find a spelling mistake! 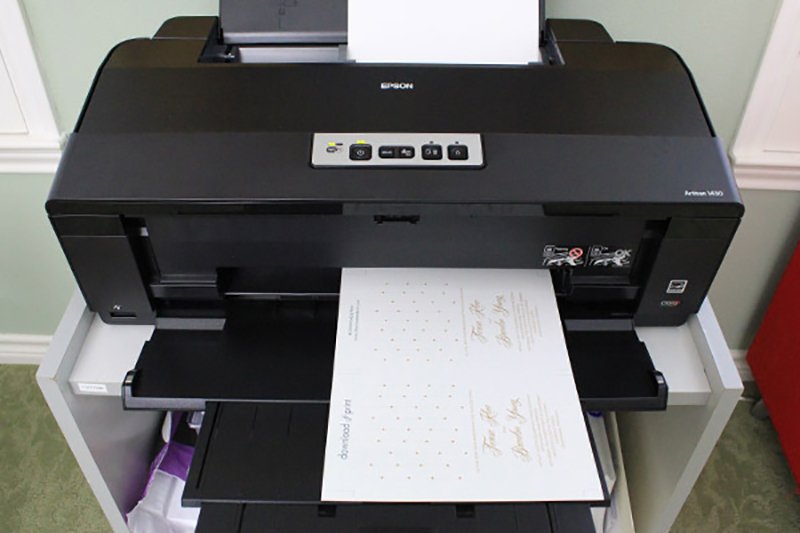 When you are sure the invitation is correct, print the invites out on card stock. Anna used white, but if your goal is a black and gold invitation, use black. Likewise, if you have a different color scheme. 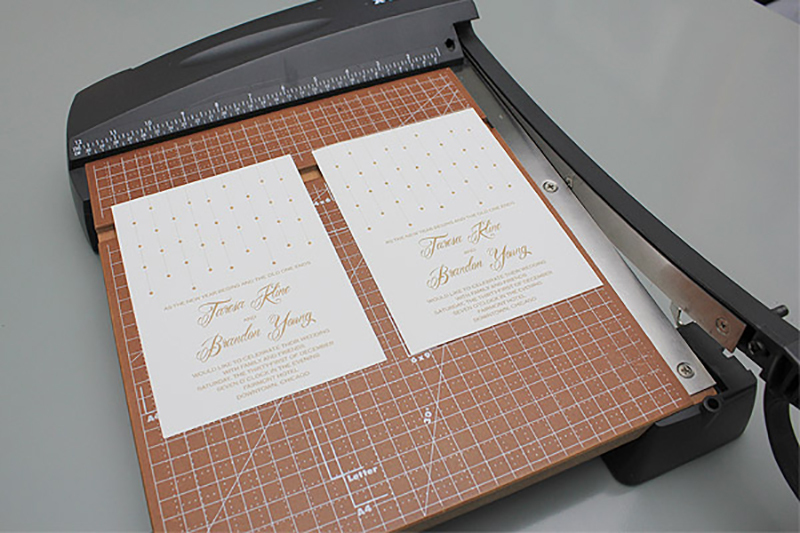 Using your paper cutter or scissors, cut each invitation along the trim lines. A paper cutter will produce cleaner cuts and will save time, but scissors will work just fine. Anna also used a corner rounder to curve the corners (you should be able to easily find a small one with scrapbooking supplies online or at your local craft store). 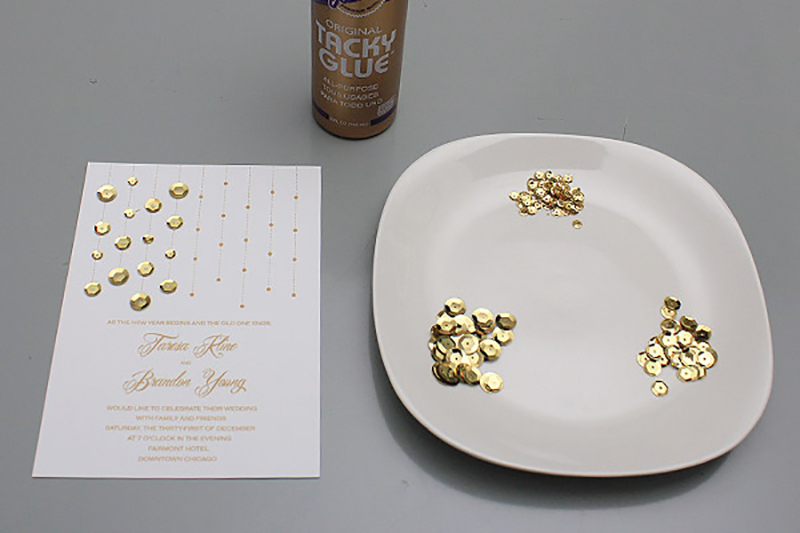 Using the dots on the invitation as a guide, glue on gold sequins (or silver, or whatever sparkly embellishment you choose). 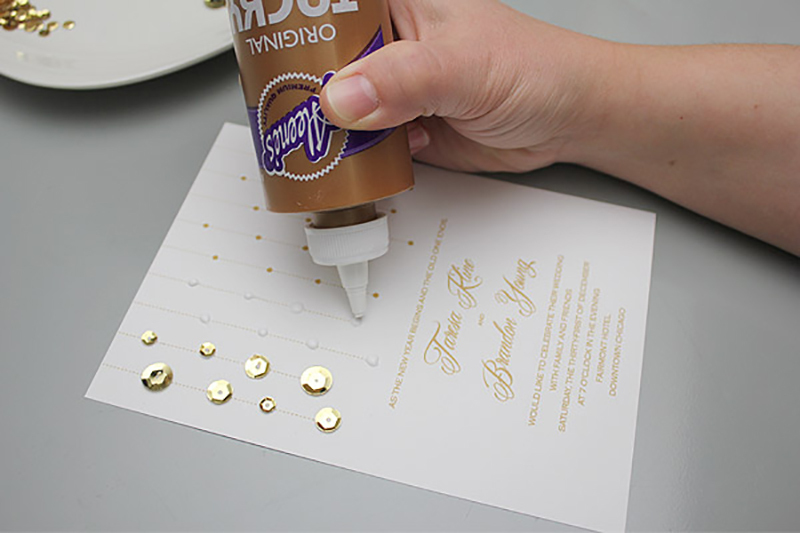 Place a dot of glue on each dot on the invitation and press on a sequin. Anna likes to work four rows at a time for the best efficiency: dot four rows with glue, and then pressed on the sequins before moving to the next section. Also, work left to right if you are right handed, or right to left if you are left handed, to avoid dragging your hand through the glue. A couple of glueing tips: Creating a random pattern of 10mm, 8mm, and 5mm sequins looks best. Also, don’t panic if your glue dots are different sizes or you get glue “strings”. The glue will dry clear. Allow at least 24 hours to completely dry. The invitations will then be ready to stuff and mail!